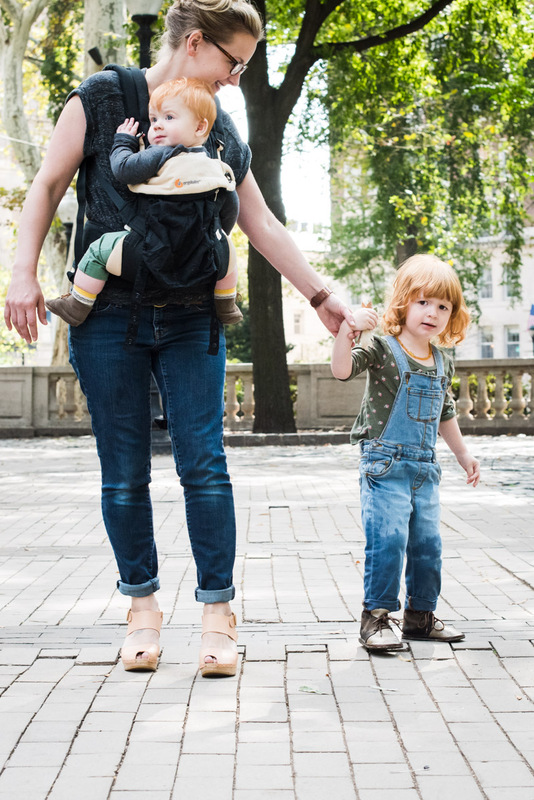 I’m always intrigued by how other moms manage the work-life balance (nanny or naptime? ), as well as some of the minutia of our everyday lives (what shoes do you wear everyday?). 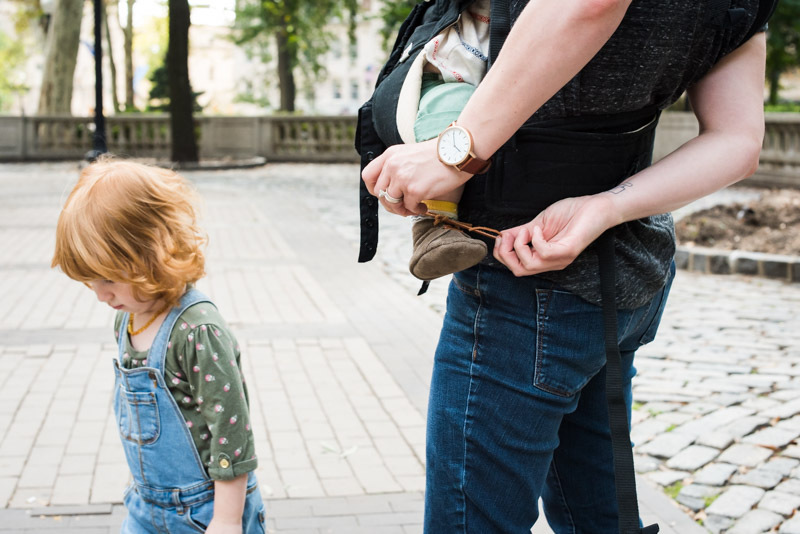 So I thought it would be fun to feature, from time-to-time, a mama who might offer a little insight or a unique perspective on how they manage this daily chaos. 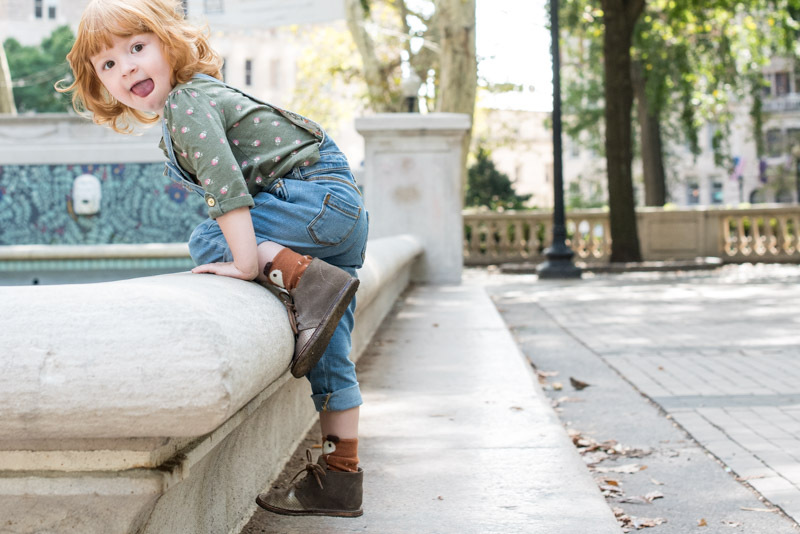 So on that note, I’d love to introduce you to Heather, founder of Mason Dixon Made, a line of children’s footwear that is – gasp – made by hand in Philly. 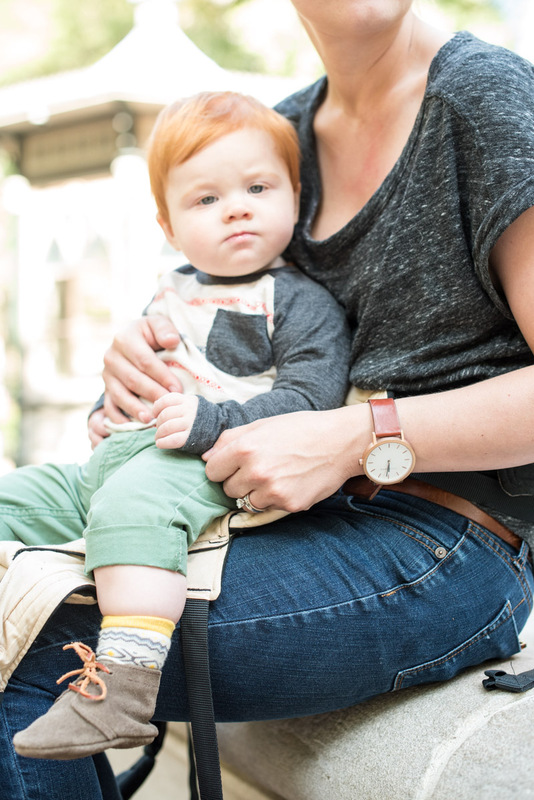 I had met Heather at Lulus’ Casita last year, and was blown away by her designs (and her redheaded children, SWOON). You make shoes. Are they all handmade, by you? In Philly? My shoes are handmade by me in my home and Fishtown studio. My husband is a huge help and is often up late with me cutting or stitching pieces by hand. It is quite possible I leave some of the more unsavory tasks to him, like trimming all the plantation crepe soles… lol. How long does it take to make a single pair? Many hours go into each pair of shoes. There is a lot of handwork involved in making them. We cut the leather by hand, stitch them and hand-tie the leather soles on- we even hand cut leather laces. How do you manage your schedule? What does a typical day (or week) look like for you? I have a nanny that comes three mornings a week so I can get in the studio to work. I use nap time for “office” work: marketing, design, talking with retailers and suppliers. After the kids are in bed for the night I either head back to the studio or I work at my dining room table, either cutting out shoes or assembling baby booties. I typically work all day Saturday while my husband has the kids and try to keep Sundays for family time. When I’m not working during the week, I try really hard to stay off my phone/computer to be present with my kids. I use that time to get us out of the house, and outside. Top three can’t-live-without beauty products. Go. 1. Bare Minerals Matte Foundation – I cannot go out into public without this on. It’s lightweight coverage evens out my skin and makes me feel beautiful. 3. Lately I’ve been into lip crayons for a quick pop of matte color, I like Tarte Lip Surgence. I also always have a few Burt Bees tinted balms in my bag too. My favorite pair of shoes are my Bryr clogs. They are made by hand in California and I am OBSESSED. 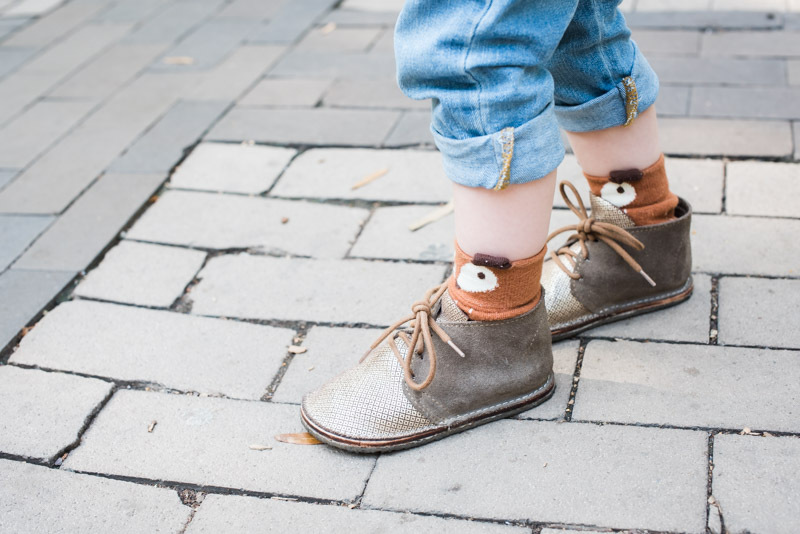 The cutest possible shoes you grab when you know you’ll be walking around all day? In the summer I live in my Saltwater sandals – they’re cute, comfortable and wear really well. My pair from last year still looks brand new and I wore them almost daily. From fall through winter, I pretty much wear boots exclusively. My favs are my Frye Melissa boots, my black Schuler and Sons (made in Philly, but no longer available) and my ankle booties from Madewell. 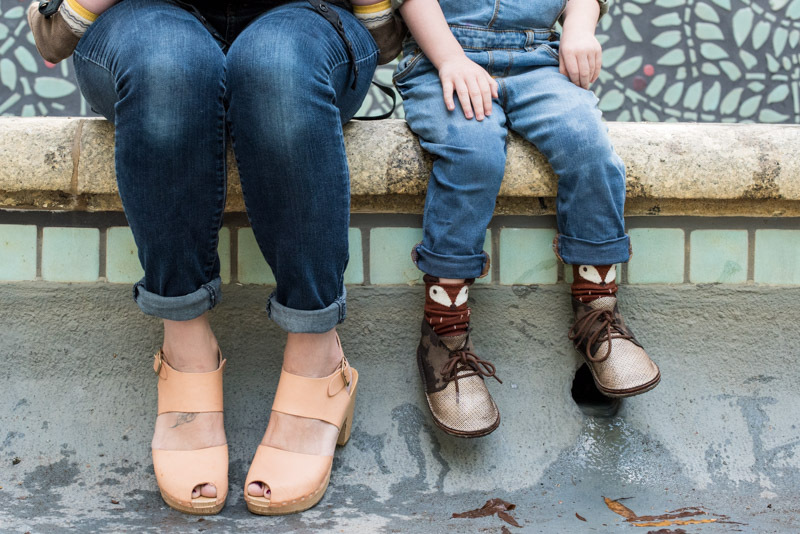 Your go-to mom uniform for days with the kiddos? You know, I don’t own any rain gear and I usually forget an umbrella. Heather, thank you so much for being such a good sport! I so appreciate this little glimpse into your life (and you are working hard, Chick). Rock on. Loved this! She looks so comfortable and casual. Ad her hair – super pretty. I love her relaxed style. Her redheads melted my heart. My redhead is almost 18, and I miss those days! Love these types of features – thanks!